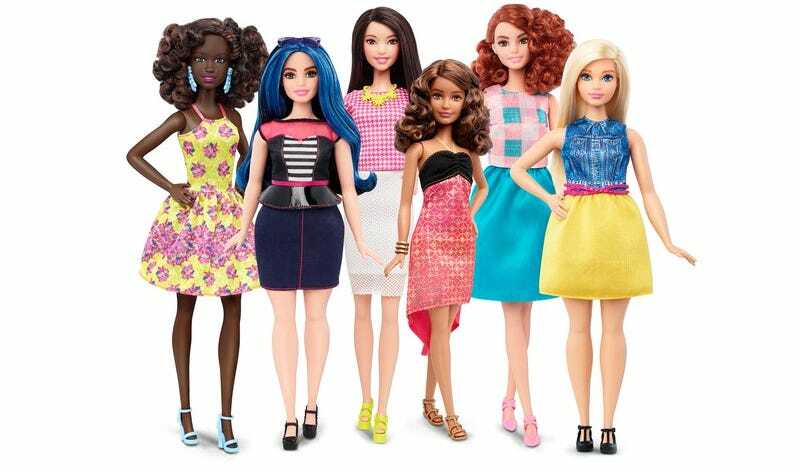 Fifty-seven years after first giving little girls an unrealistic representation of what a woman’s body should look like, Mattel is finally introducing three new versions of the iconic doll featuring tall, petite, and curvy body types. Already available for pre-order on the Mattel website, the three new versions of the doll join the original in the continuing Barbie Fashionistas line. So while little kids no longer have to feel bad about not looking exactly like the slender, impossibly-proportioned version of the doll that’s been available for half a century, they still better make sure they’re keeping up with the latest fashion trends if they want to feel accepted. Great. In a comprehensive advertorial over on Time’s website, Mattel’s Evelyn Mazzocco, the head of the Barbie brand, admits that it’s taken the toymaker a long time to adapt the doll to more modern views on beauty and accepting the uniqueness of one’s own body. But Mazzocco also points out that “changes at a huge corporation take time.” It’s not a completely implausible excuse as to why Barbie has gone almost entirely unchanged for close to 60 years; changes to a factory and manufacturing processes do take time. However, since 1959 Barbie has switched jobs hundreds of time, requiring new accessories for each one. She’s had more costume changes than a thousand Broadway musicals, has lived in countless beachside dream homes, and has had a fleet of sports cars that have always reflected the latest models available in the real world. Everything else in the Barbie toy line has easily adapted and kept up with the times, so there’s really no reason why the doll itself couldn’t until now. Oh, wait, it turns out that Mattel now has to produce two different sizes of shoes to accommodate the new versions of Barbie. One can’t even begin to comprehend the logistical nightmares behind such a change.